Mobile health is fast becoming a strategic priority for healthcare organizations nationwide. And it needs to be – mobile traffic is now far out-stripping desktop traffic to hospital and health system websites by a ratio of nearly 2:1. Looking at the Digital Hospital 500, nearly two-thirds of website traffic now comes from a smartphone or tablet – and it’s a growing trend. According to figures from web measurement firm SimilarWeb, of the total combined monthly web traffic of 189.9 million visits to Digital Hospital 500 organization websites, 62.1% (or 117.9 million visits) came from a mobile device in 2016, compared with 37.9% (or 72.1 million visits) from a desktop computer. And that mobile percentage is up from 59.9% in 2015, when 103.7 million of the 173.1 million total visits to Digital Hospital 500 sites came from smartphones or tablets, while 40.1% (or 69.4 million visits) came from a desktop computer. Consumers are indeed clearly creating the need for healthcare providers to ensure that their customer-facing digital assets are mobile-ready. And, in large part, that’s exactly what providers are doing. 76.4% (382) of Digital Hospital 500 organizations currently have responsive sites that adapt to any screen size, and 56% (282) have deployed at least one mobile app. Applications and responsive websites are all well and good. However, the question is: Are the mobile health solutions currently on offer really paying attention to and addressing patients’ actual wants and needs? For Douglas Wood, MD, Medical Director at Mayo Clinic’s Centre for Innovation, an answer to the affirmative is far from certain. Wood believes that, despite the widespread adoption of mobile solutions across the board, many are only serving to widen the disconnect between patient and provider rather than close it. The problem, he says, comes down to misconceptions of what people expect from the patient experience. "We've created these mobile health solutions that we think people will use, without really understanding what people really need," Wood says. As an example, Wood notes that there are literally hundreds of diabetes apps now available on the market – but very few that are actually delivering the healthcare benefits they are presumably designed for. This is because doctors and developers are creating these apps for diabetics, when they should be creating them for real people who are living with diabetes. What mobile health needs to do, according to Wood, is “fundamentally understand what people need and then create solutions that help them. People know a lot about their own health and what they want to do," he says. "If we just let them, they'll do well." It’s no overstatement to say that Mayo Clinic is a mobile trendsetter in healthcare. Indeed, mobile is ingrained into the very fabric of Mayo’s operations. “Mobile access is an assumed part of our patient-facing web strategy,” says Dr. Steve Ommen, Medical Director of Mayo Clinic Connected Care, the clinic’s web-driven health information networking program. Something – or rather a lot of things – are clearly missing from the patient experience when providers make it difficult for patients to access the information they need when they need it. Patients shouldn’t have to take their own notes and make their own follow-ups – especially in the smartphone era. With the Mayo Clinic app, they don’t. 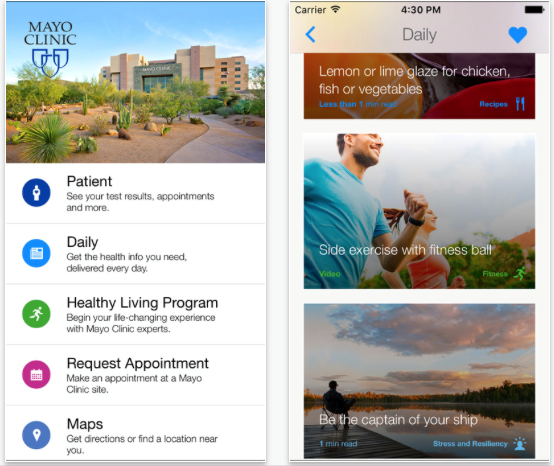 The Mayo Clinic app is designed to service patients before, during and after visits, providing a mobile health experience built on convenience, and one that helps patients manage their own health, records and appointments. Upon arrival to a Mayo Clinic, firing up the app brings up a map of the building, guiding patients directly to where they need to be for their appointment. Appointment lists are also displayed with a few simple swipes, providing all the details of who the physicians are that patients will be seeing, along with any data from lab tests, and notes from doctors’ analyses of previous exams. Logging into the app is done via thumbprint, creating ease of access as well as heightened security. If appointment details are changed, the information is sent to the patient via the app, and as soon as any test results are available, the patient is notified and can view them right then and there directly from their handset. In addition, there are also sections filled with tools and guides that patients can use to better manage their own health. It’s an exemplary service, and one that enables convenience in abundance, aids communication between doctor and patient, and provides the sort of transparency that patients too often feel is lacking from their providers. Mayo Clinic’s advanced mobile health platform is extremely popular with patients. More than 750,000 users have downloaded the application across Android and iOS, which facilitated the sending of more than 1.1 million patient-initiated secure messages to Mayo providers last year alone. 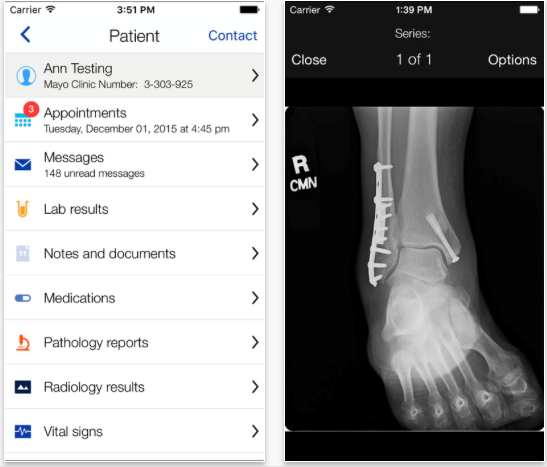 Over 10,000 appointments were requested via the app, which has also recently been updated with brand new features that allow patients to view their X-ray and other radiology images directly from their smartphone. As more and more patients expect increasingly sophisticated mobile health options to guide their care, Mayo Clinic is at the forefront of the industry, and will no doubt continue to make mobile a big part of its strategy, providing the innovative and streamlined patient experiences that people want and need. Hear Thomas G. Howell, MD, Patient Experience Medical Director at Mayo Clinic Health System, at Next Generation Patient Experience 2017 this November.